Separately, the Center filed a detailed analysis of lawsuits, police reports and litigated cases that shows the dangers of seat back collapse are far greater than what the agency recognizes because seat back collapse is not captured by the FARS database on which the agency has relied for all too long to deny there is a seatback collapse danger. FARS does not provide any information on seat back collapse. Out of 64 seat back collapse death and injury crashes, the Center only found 2 where the police report referenced seat back collapse. The petition reports on the results of an analysis of NHTSA data by Friedman Research Corp. 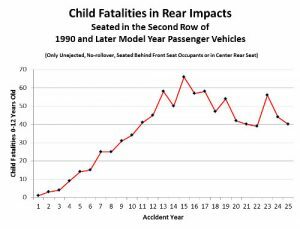 Done at the Center’s request, the analysis shows that over the twenty-four year period 1990-2014, nearly 900 children seated behind a front-seat occupant or in a center rear seat died in rear impacts of 1990 and later model-year cars. In 1974, the petition notes, NHTSA announced its intention to develop a new standard “covering the total seating system” and requiring dynamic rear-impact crash testing. But thirty years later, in 2004, it abandoned the plan, saying it needed “additional research and data analysis” and leaving in place the woefully weak requirements of FMVSS 207, a standard which has not been upgraded since its adoption in 1967. 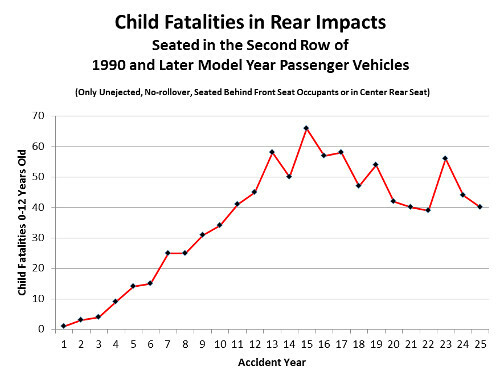 In its conclusion, the petition states that warning parents of the hazards of front seatback collapse to children in rear seat is an essential measure “made necessary by the continued absence of a federal motor vehicle safety standard requiring that cars be equipped with adequately protective front seats.” The agency “can take most of the requested steps on its own, without time-consuming rulemaking, and should do so promptly,” the petition notes.